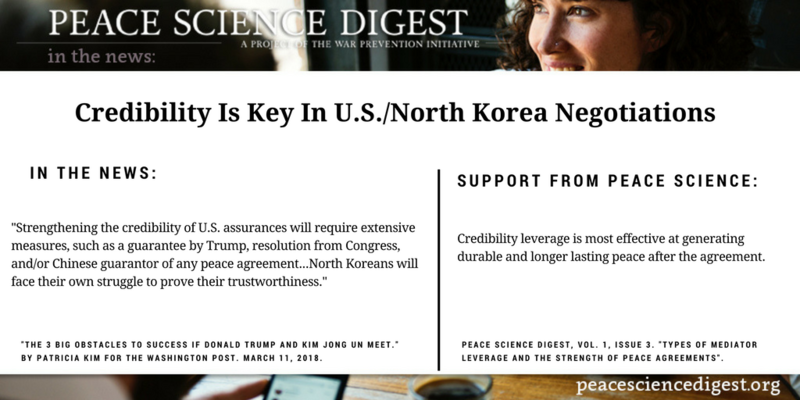 In upcoming talks between the U.S. and North Korea, the credibility each party brings to the negotiation table is vital to the strength of any future peace agreement. And a lot of work needs to be done on both sides to make sure credibility exists and remains intact. For North Korea to lay down its nuclear weapons, Kim must be genuinely convinced that the United States will not harm his regime. Strengthening the credibility of U.S. assurances will require extensive measures, such as a personal guarantee by Trump, a resolution from Congress, and/or a Chinese role in serving as a guarantor of any peace agreement. But even these measures, difficult as they will be to arrange, may not go far enough to satisfy a regime that is convinced the United States seeks to overturn it. Peace agreements mediated with credibility leverage last over twice as long as agreements without credibility leverage. Credibility leverage is most effective at generating durable and long-lasting peace after the agreement. “The 3 big obstacles to success if Donald Trump and Kim Jong Un meet” by Patricia Kim for the Washington Post. March 11, 2018. Peace Science Digest Volume 1, Issue 3: “Types of mediator leverage and the strength of peace agreements”.